In the last few weeks, I have been using Python and Qt, especially PyQt extensively. During these weeks I have discovered a few ways how to shoot yourself in the foot accidentally. 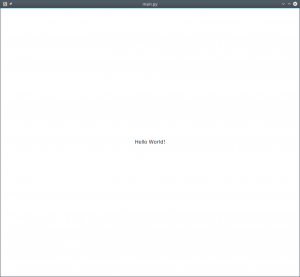 In this article, you will learn which things you should watch out for when working on GUIs with Qt and Python and how to avoid the resulting problems. The first thing you will notice when writing your first hello world application with PyQt is that you can't stop it anymore from the command-line with Ctrl-C. This code snippet works perfectly fine and when you execute it you will see the hello world window as expected. However, the first time you try to stop the application from the console you will see that Ctrl-C has no effect and the application just keeps running. Qt strongly builds on a concept called event loop. Such an event loop enables you to write parallel applications without multithreading. The concept of event loops is especially useful for applications where a long living process needs to handle interactions from a user or client. Therefore, you often will find event loops being used in GUI or web frameworks. However, the pitfall here is that Qt is implemented in C++ and not in Python. When we execute app.exec_() we start the Qt/C++ event loop, which loops forever until it is stopped. The problem here is that we don't have any Python events set up yet. So our event loop never churns the Python interpreter and so our signal delivered to the Python process is never processed. Therefore, our Python process never sees the signal until we hit the exit button of our Qt application window. To circumvent this problem is very easy. We just need to set up a timer kicking off our event loop every few milliseconds. 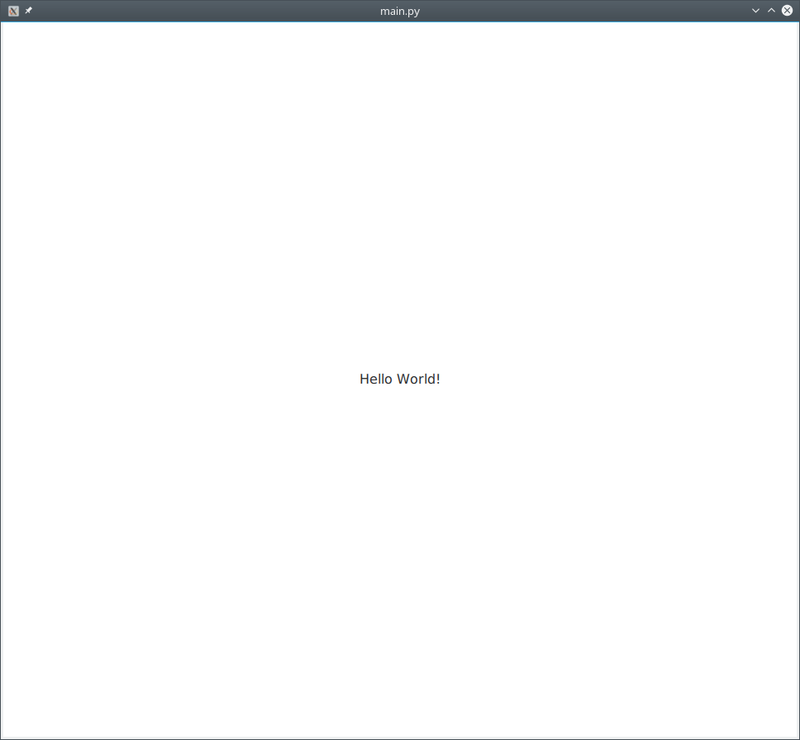 All we added to the hello world application is the code to start to create and start a timer every 100 milliseconds. This way we can safely terminate our application with Ctrl-C from the command line. NOTE: Don't forget to store the variable containing the timer instance somewhere or your timer instance will be garbage collected. 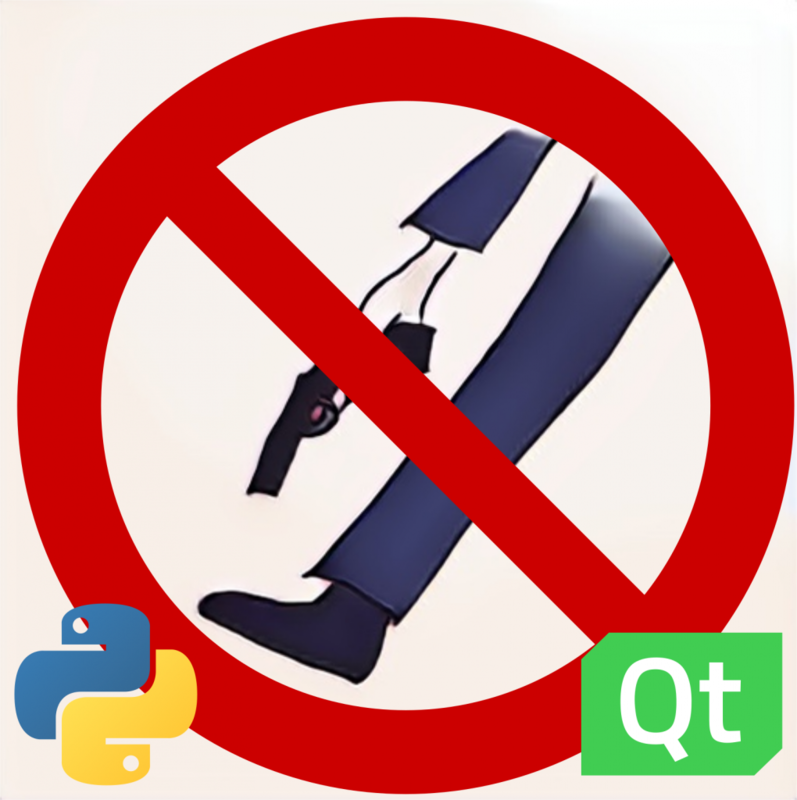 Another "Shoot yourself in the foot" experience that you will potentially have using Python and Qt is related to memory management. As we all know, Python supports automatic memory management, meaning a garbage collector looks for variables that aren't referenced anymore and frees memory. This usually works very well and it's probably one of the features that make Python way easier to work with than for example C++. C++, on the other hand, allows more freedom when it comes to memory management. Freeing up resources is up to the programmer and in the responsibility of the C++ class. For this purpose, C++ objects have a destructor which is called when an object is destroyed. However, for more complex applications memory management isn't as easy as it sounds. Who is responsible for cleaning up objects created outside of an instance and assigned to another object instance for example? Qt and many other GUI related frameworks, therefore, come with their own memory management mechanism that is especially suitable for window-based graphical applications. The principle is pretty simple. Every object can have children and it is responsible for cleaning up its children. Let's say for example an application window has a child which is a button. When the window is closed, the window calls the deleteLater function of the button. This ensures that for example a complex GUI form is cleaned up in the right order. Additionally, QObject's do not delete their children instantly, but instead, delegate the object deletion to the event loop. This ensures that for example objects created in other tasks are also cleaned up correctly. To further complicate things, QtQuick also has a garbage collector similar to Python. In most cases, you don't need to really care about Qt's memory management when working with Python and Qt. 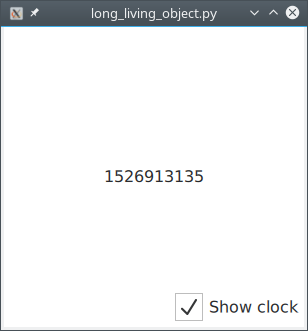 However, in some cases, it is possible that the Python object, or parts of it, lives longer than the Qt object. In this example, we have GlobalTimer class which is instantiated as global Scheduler object. Inside the Clock class we register the tick function to as a callback. When we uncheck the showCheck checkbox, the Loader destroys our Label and Clock components. However, our global Scheduler object still keeps ticking and we soon see the following error in our console. It turns out our Python object outlived the QObject because the global Scheduler object still has a reference to our tick instance function. Of course, we shouldn't design our application this way in the first place, but sometimes we depend on external libraries that we can't control. For example, a middleware library which triggers callbacks when a message arrives. Well, the solution sounds trivial, just unregister our callback when the Python object is destroyed. But wait - Python classes do not have a destructor (yes, there is __del__ method, but our Python object still lives, doesn't it?). Luckily QObject has a signal that is triggered before destruction, the destroyed signal. Okay, you quickly will see that it doesn't work. - Another hole in the foot. And finally, our application doesn't throw errors anymore. NOTE: Qt signals and slots are disconnected automagically on QObject destruction -> therefore, if you can use Qt signals and slots instead of callback functions. Alternatively, we could also use a weakref in this particular example. Python and Qt are a great combo. However, it is very easy to shoot yourself in the foot. Always keep Python in the loop. Use references to Python Qt objects carefully and cleanup correctly. I hope you have enjoyed reading this blog post and if so please subscribe and share it with your friends. I'll tell you what would make it less hard to shoot feet, if there was some decent ***ing documentation. Pyside had great documentation. Pyside2, not so much. And heres the kicker, its *just* different enough in undocumented ways that its borderline insanity inducing. From the API point of view, PyQt5 is very similar to PySide2. You could use on the wrappers, such as [python_qt_binding](https://github.com/ros-visualization/python_qt_binding) for example, and work for the most part with PyQt docs. Also, the Qt/C++ docs usually help when it comes to the Qt API in general. Are people actually using QML? Yes. I use QML since the Symbian/Nokia days. 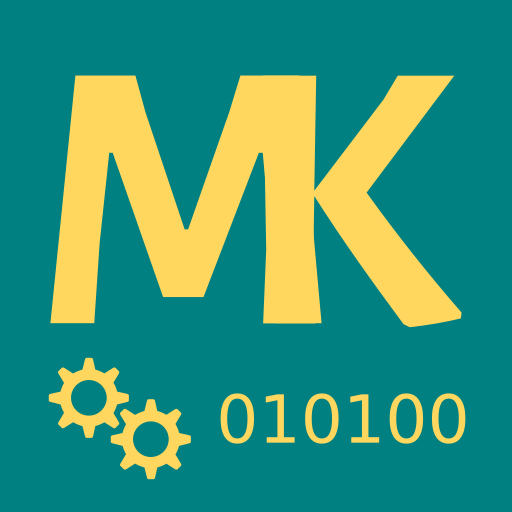 QML is useful for any project that goes beyond the typical desktop application. I use it in all of my projects nowadays since I work on machine HMIs. If you are primarily targeting desktop computers, choosing widgets over QML might be a reasonable choice. However, the trend on the desktop is towards non-native applications thanks to the rise of the single page web apps, and so QML also becomes more relevant for desktop applications. Things like the QML designer and Qt Quick Controls are also getting more comfortable to use so that QML might become an interesting choice for novices as well. I wish there was a more comprehensive tutorial or book on PyQt5/PySide2, most of the stuff I can find online is geared towards the very basic use cases. I agree. There was someone on the PyQt mailing list recently working on a new PyQt5 book for Packt. I also was thinking about creating some video courses or writing a book myself, but I'm not committed yet. I'm wondering how many people are interested in learning Qt in the Python world? I would and I'd be willing to pay for it, as I'm using it for a work project and we plan to continue using Qt5 with python.